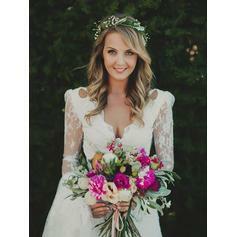 This dress is simply lovely; the perfect blend of elegant and whimsical. Having seen the same photos advertised elsewhere I was not quite sure what to expect from this seller, but decided to take a chance when they responded so helpfully to my enquiries. I am very glad that I did, for I found their work to be of good quality and very reliable in shipping estimates. I even asked for some customization (higher by 2" in the front and 7" in the back) and was accommodated perfectly in both cases without any additional charge. I was a bit concerned about ordering online from so far away, but found the communication top-notch, with all of my questions answered in less than a day. 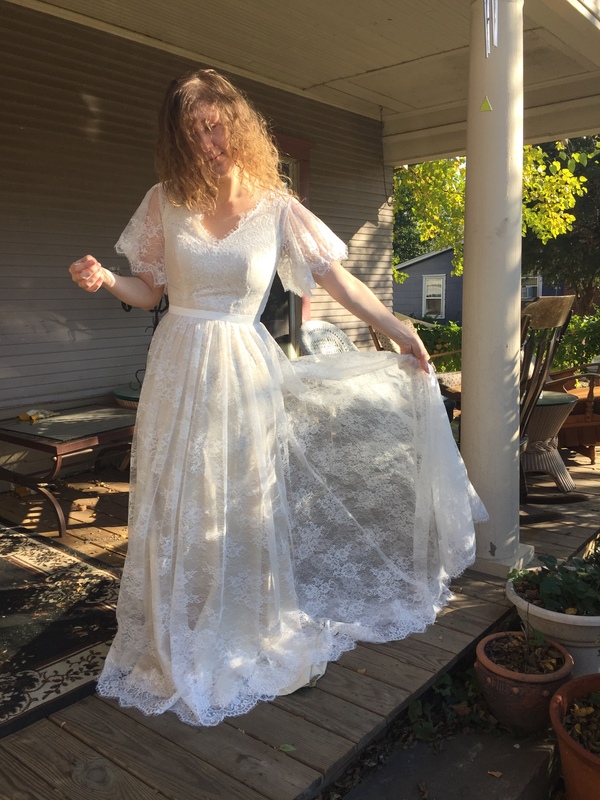 I was also needlessly worried about the quality of the dress--it is just as pictured and made of both a heavy/sturdy under layer and a light and flowy lace overlay. I will say that I did not expect when ordering "ivory" that only the under dress would be in ivory, while the lace is in white, but I find now that I actually prefer this to any other option, as the lace stands out in contrast and the ivory is of a very slightly yellow hue that might have been overpowering had the entire dress been the same color (as it is now they complement one another quite beautifully). I received my dress in less than a month after placing the order and was very pleased with the notification I received during the shipping process (I did let them know of my time constraints directly, of course!). This quick delivery left me more than enough time to check things over before my wedding day. I will say that you should order true to size because the dress I received fit me like a glove, and almost too tightly, since I had gained a pound or two since providing my measurements. I've thankfully had time to remedy this issue, but still, keep it in mind. :) I also ordered a bit long for the sake of my shoes and because I was worried it might come short (I am 5'10"), but I wish I had ordered more exactly, as it is just slightly too long. This was my decision, however, and the under-dress is easily hemmed, while the lightness of the lace layer makes it quite easy to maneuver in any case. Overall, I am very pleased with my beautiful dress, and am so glad to have found such beautiful quality at such a reasonable price. Thank you very much! I am totally in love with this dress, the shipment was fast, the dress is perfect. Same to the picture. Thank you! 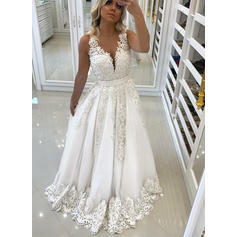 Je ne peux pas commencer à exprimer à quel point j'aime cette robe elle est absolument magnifique parfaitement et très bien faite pour le prix .. ne peut pas attendre de le porter ! !